A walker was airlifted to hospital after being caught in an avalanche on Wales’s highest mountain. The man was struck by the avalanche on the Pyg Track on Snowdon, one of the most popular ascent routes up the 1,085m (3,560ft) mountain. Llanberis Mountain Rescue Team was alerted about 1.20pm today, Saturday, after the man who was with another walker, was injured in the incident about 200m above the interchange where paths meet the mountain railway. Many of the team were on another rescue so the Llanberis rescuers requested help from the neighbouring Aberglaslyn MRT. Seven of the team made their way to the scene on the mountain, which was covered in low cloud. An Aberglaslyn MRT spokesperson said: “Once on scene, the male reported to have been knocked unconscious for over 15 minutes as a result of the avalanche and complained of a numbness to his lower back area. “He was immediately immobilised with a vacuum mattress, a specialist piece of equipment which moulds to the shape of the casualty to prevent any movement of the spine and secured into a stretcher. The rescue took 4½ hours. Please read @safesnowdonia and @wardeneryri Tweets for latest info on avalanche risk. The @safesnowdonia ground conditions reports are next to useless. In fact, they are dangerously misleading. 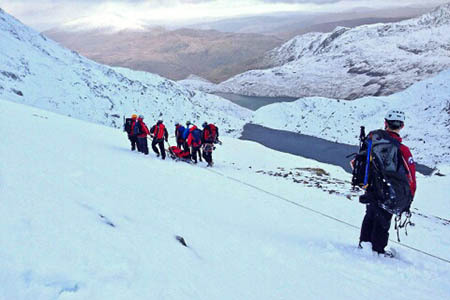 Yesterday, there was no mention of avalanche risk anywhere in Snowdonia despite the fact that walkers and climbers have been witness to multiple avalanche events on Snowdon and in the Carneddau in the past few weeks. It is well known in the local outdoor community that the warden service no longer has the expertise to provide good mountaineering advice. You guys should have a long hard think about the next time; where you might find yourself in a coroner's court explaining why you gave such poor advice or submitted that misleading report. "Yr Wyddfa/Snowdon: Some snow above 400m, snow more extensive above 500m. Snow depth increases with height and drifting. Snow is compacted on paths making conditions very slippery under foot. Conditions changeable. Crampons and ice axe essential." a slightly less self righteous member of the general public/experienced outdoor professional. Having looked at the report in question, I fail to see what was misleading about it as it seemed to provide a basic overview of the ground condition for a very busy public mountain as opposed to providing detailed mountaineering weather information. You would hope that people that are going to go up into the mountains and HAVE been advised that the conditions are hazardous, would take the time to look for actual mountaineering weather reports. As a member of the local outdoor community I would of thought you would of liked to spend your precious time providing valued safety information rather than trying to fragment what remains of the communities we have. Hi "a slightly less self righteous member of the general public/experienced outdoor professional." I seem to have upset a particularly arrogant member of staff from the National Park Authority! Calling me self-righteous says an awful lot more about your attitude towards mountain rescue than I need to point out. You fail to see what was misleading? You didn't mention the CONSIDERABLE avalanche risk! Yesterday people from OUR community were dealing with category 3/4 avalanche conditions. Six people were taken and one was completely buried! What scares me is how you could possibly have gone up there to do the assessment and not notice how serious the avalanche conditions were? How could you not report it? You did go up there didn't you?? Or worse...did you go up there and not even KNOW it was serious? Your Wardens are in WAY over their heads! 1. "Some snow above 400m" - You can see that from the road. 2. "Snow more extensive above 500m" - Empty words! How often have you been out and NOT seen more extensive snow as you go higher? Besides scouring...which you also fail to mention. 3. "Snow depth increases with height and drifting." - Oh really? Haven't you just said that? 4. "Snow is compacted on paths making conditions very slippery under foot." - What about the rest of the mountain?! Did you not notice the 3 foot of windslab build-up after last week's hurricane? And what of the 10 foot cornices? 5. "Conditions changeable." - This weak and arrogant caveat is not going to sound very good in the coroner's court. 6. "Crampons and ice axe essential." - There....the only piece of useful information for "Joe Bloggs"
You should boil your report down to: "It's white up there. Wear spiky things"
If those people yesterday had have died, it would have been a scandal and it would only be right that you'd be made to shut your ground conditions service down. Something which you should strongly consider doing. If one of your inexperienced Wardens die up there. Someone is going to jail. It is a shame you don't have the confidence in your own opinion to put your name to your comment. It is also concerning that you have known of "multiple avalanche events on Snowdon and in the Carneddau in the past few weeks", and yet didn't follow your strong moralistic urge to make the public (perhaps via the MountainSafe group?) aware of your knowledge sooner. Maybe another confidence issue? Please feel free to call in to Pen-y-pass for a chat to discuss the above. Is wanting a name really all you have to say on the matter? Why no mention of wind slab or cornices? Whatever turf war is going on here needs sorting out before someone gets seriously hurt. I like to know with whom I am speaking. I wasn't aware of a 'turf-war'. This is why I invited the concerned writer to discuss their thoughts amicably, and in person. Very slim chance that you'll get an answer from him on here. His position is indefensible. My bet is he goes conspicuously silent on the matter. How about it Dewi? Calling me out? I'm calling you out. Answer these three questions. 1. Did someone go out to assess the conditions yesterday? 2. Why didn't they notice the awful conditions? 3. Are your staff trained to keep themselves safe and to provide high level advice to novice hill walkers? I am pleased to see that the appropriate warnings have now been placed on the Met Office mountain weather forcast! It's sad to see an MRT member having to raise the issue before it's considered necessary to do so! How about it Dewi? Answer these three questions. sounds like the walkers did not set off the avalanche, and if people want to go out in the hills i would recomend attending a winter intro course that would include basic avalanch education. Accidents can and do happen even to the most experienced. Do I understand correctly that on the day of a massive avalanche, the park wardens had been up there to assess the conditions for the met office and got it completely wrong? If that's the case what is even the point in providing them? I'm surprised more isn't being made of this. If the helvellyn fell top assessors got it this wrong there would be an outcry! An arguably equally self-righteous member of THE GENRAL PUBLIC/experience outdoor profetional. Thank you for re-iterating your original thread in the form of bullet points so that my tiny mind can understand it. Let me return the favour. 1. I DO NOT WORK FOR THE NATIONAL PARK. So your assumption that my comment was only based on the fact that I was the individual that you publicly criticised was completely wrong. I was moved to join this tread because instead of wanting to share your knowledge and expertise with the park in order to increase public safety you opted to use this forum to grind your own political axe. So although I don't share all the park's ideologies I can see that at least they try and communicate with people in a professional manner in order to make things better in future. Might be worth trying? The park wardens do communicate with 'Joe Blogs', tourists that are looking at twitter before planning a walk (wearing trainers and jeans) in the most popular destination in Wales. As these people aren't stood on the road looking up at the hill while planning what to wear, info such as whether there is snow, mist, high winds etc.. is fairly usefull. That said having links to actual detailed mountain weather reports as standard would be a good idea, but that idea can be communicated as easily as I did just then, instead of an all out assault on organisations and individuals, again projecting the impression that politics is at the heart of your contribution and not safety. 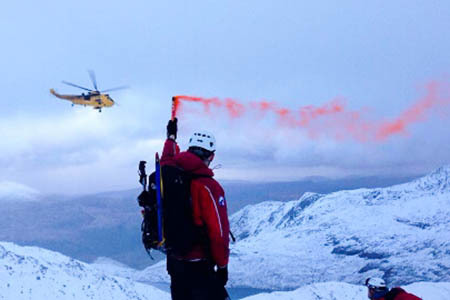 This addresses the concern that using the title mountain rescuer in your rant suggests that you are speaking on behalf of the mountain rescue organisation, pitching one organisation against another and creating the atmosphere of a 'turf war' which again is unproductive and completely unprofessional. As I, quite genuinely, have worked in the outdoor industry thoughout the UK for 15yrs (NOT THE PARK) and know people from mountain/coastal rescue, emergency services as well as local and park authorities (who's work, as yours, I very much value) I know that the overwhelming feeling is that all bodies should work together for the good of the communities they serve and not publicly trash each other, which inevitably FRAGMENTS COMMUNITIES! I hope that this has clarified my original point. This will be my last 2 pence worth as I've got better things to do but be safe out there! An arguably equally self-righteous member of THE GENRAL PUBLIC/experience outdoor professional. Ironically you are guilty of exactly what you are accusing me of doing. I have no political agenda - and nothing I have said implies it. I am a single issue avatar. I haven't once launched an "all out assault" on the national park. I have just vented my frustration at their closing the stable door once the horse has bolted... two weeks ago. Mountain rescuers spend too much time actually picking people off the hill to do the park's job for them. The park is funded, MRT is not. You only need to look at how seriously other mountain areas take their responsibilities to understand that visitors and mountain rescuers in Snowdonia are being handed the short straw. Your fragmenting the community point is a bit strange. If you've worked in the outdoor industry as long as you say you have, you'd know that hardly anyone partakes in your giant mythological multi-agency love-in. And lastly, the thing that gives you away as an employee or close associate of the park is the fact that you are defending them. Remember friend: The first step to improvement is acknowledging that something is wrong. I might be an anonymous troll on the internet, but at least I am speaking the truth and declaring my agenda. Without an agenda you look like you're defending something that is blatantly wrong just for the hell of it. MRT Guy / self confessed internet troll. Okay you pulled me in once more! Seems we're getting to the bottom of it. The park are funded, MRT are not, you don't want to do their job for them?.... Safety first? I'm not suggesting you do their job, I'm suggesting that helping improve something that is there and isn't going away might reduce the amount of people you need to pull of the hill. The Park are a nationally known brand that communicate to a large number of people (a lot more than are going to be bothered to painfully claw their way to the end of this tedious stream) so it makes perfect sence that they use that platform to give safety info and for the local MRT to help improve/spread that info to as many people as possible. You've spent enough time on this thread! So you may have time to make other positive contributions! and as we know prevention is better than cure! I've already said that I don't share all the parks ideas and that isn't just your park, but parks throughout the uk and I have also previously mentioned that the BASIC ground condition service could be improve by adding detailed mountaineering info links for those that are heading off the tourist route on their own, who as you well know should have sort out their own safety and weather info. Any lack in service can be improved apon without calling for a complete shut down. I also haven't suggested that there is a multi-agency love-in, although I can't speak for those who choose to wear Ronhills, I'm saying that thankfully most of the people I've met in our industries put safety and teamwork above moaning and blaming! No organisation or indevidual, apart from possibly yourself, is perfect so all we can do is IMPROVE on what we've got! And I've got you babe! And thank *#~! Finally, I DO NOT WORK FOR, OR AM AN ASSOCIATE OF, OR BENIFT FROM THE NATIONAL PARK! I just don't agree with you! and really is that so hard for you to imagine.... Your not very agreeable! I'm assuming you'll come back as you seem to be the kind of guy who likes to have the last word, so any further speculation you may have about who I am or what my reasons are for communicating, I'll refer you back to any of my previous comments as you'll probably find the answer in there. It's been real. Now it's time for me to switch off and go do something less boaring instead....Why Don't You. Bottom line is, report didn't mention high avalanche risk (which has been prevalent throughout Scotland of late) and it should have done. I appreciate there may not be the same specialised service in Wales as the SAIS here in Scotland but without any mention of this considerable risk, over and above the usual 'it's snowy/icy and cold, don't be a numpty, use axe and crampons' etc that was provided, Joe Public might not even have thought about the possibility of avalanches on what is a very popular tourist route. Stating the conditions etc etc. No one forces anyone up the hills and mountains. Conditions gradually get worse and if not equipped or experienced properly, to turn around , in many cases, this should be done, but I see it time after time if Joe Bloggs is going on then so will I.
I've said it before - increasing commercial interest 'forces' or drives the inexperieced up the hill and dare I say it, also helps to create the type of discussion started by this article. Suggesting that commercial interest caused an avalanche is preposterous. Equipment and experience don't make a difference when the ground beneath you slips away and takes you with it. In this case, all of those swept away had decent kit and plenty of experience. In fact, several ice axes are now scattered around the Pyg track, which some lucky person will find once the snow melts. Further to this, observed avalanche risk level has nothing to do with individual mountaineer's experience. Conditions are hard to judge, by wardens or walkers, as you can't see below the surface whether the surface powder snow has got wet, irrespective of how many websites you've looked at or how many times you've been in the mountains. It's blooming lucky that no one was badly injured. Congrats to the MRT and others for a brilliant rescue. Good job you, were there. I didn't say "commercial interest caused an avalanche". Equipment and more importantly experience will make a difference, by keeping you away from 'snow' that may slide. "Observed avalanche risk level has" everything "to do with individual mountaineer's experience." Yes you can tell the condition of the snow-pack, if you know where and what to look for. What exactly does the phrase 'plenty of experience' mean? I was part of a team in Scotland many years ago. Currently we seem be turning to an almost sycophantic praise of teams, possibly to cover for our lack of self reliance and responsibility on the hill, so that they will keep coming out to pick us up when it all goes pear-shaped. You're certainly very quick to judge, I actually feel sorry for you. I bet you think the sherpas on Everest last week died in the avalanche because they didn't have enough experience. Let's hope you don't get caught out. Heaven forbid you have to show appreciation to those who help you when you're in need.